On April 19, 2018, Florence Copper held a Supporter Appreciation Night to celebrate the construction of the project's Production Test Facility, and to thank long-time supporters of the project. 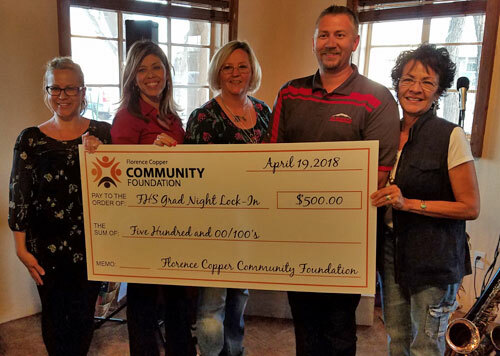 That evening, The Florence Copper Community Foundation also awarded $1500 in grants. 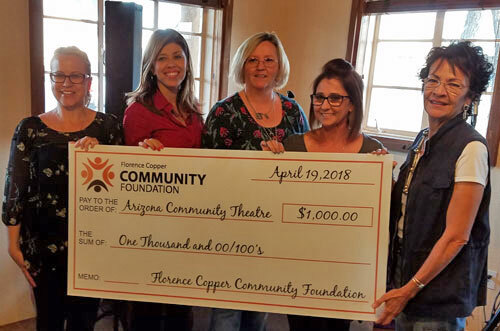 Arizona Community Theatre received $1,000 to continue their work in Arts & Culture for Pinal County. Florence High School received $500 for assistance with their annual senior "Lock In" event. It was a great evening! Thank you to everyone for coming and supporting Florence Copper and these great organizations. Florence Copper staff members Stacy Gramazio, Rebecca Rios, and Lorri Rodriguez; Florence High Principal Toby Haugen; and Foundation Board Member Dodi Freeman celebrating the grant for FHS's Graduation "Lock In". You can return to the main Awards & Updates page, or press the Back button on your browser.